San Antonio’s #1 Sliding Gates Company company since 1999. Sliding gates are a great option for any home. If you are thinking of installing a new gate for your driveway or garage. A sliding gate could be the answer… San Antonio Garage Door & Gate delivers tried and tested, reliable sliding gates for your home or office. In fact, our sliding gates solutions can fit any location. If you want to install a new gate or want to have a sliding option added to your existing gate. We can provide you with solutions for both. 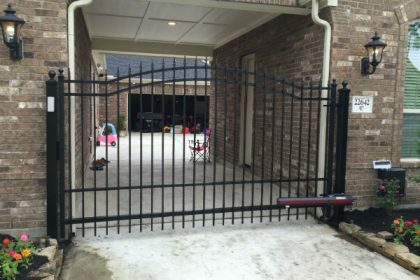 Sliding Gates Pros design, build, install, & repair wrought iron fence services. Automatic, security, & sliding gates by Sentry driveway gate pros sales & service. Texas Gate Pros top electric sliding gate opener sales, service, & repair. Sliding gates are durable and dependable, and you can choose any style you want which would suit your home or commercial / industrial facility. These gates are great to look at and we can custom build them for you according to your design specifications. You can choose from tracked and cantilevered configurations and you could either go for manual or automatic sliding gates. 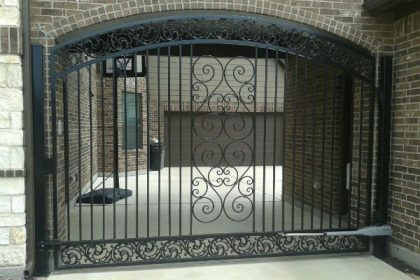 San Antonio Garage Door & Gate can custom make any type of gate you want, manual or automatic. If there is no possibility of laying tracks across your driveway, our cantilevered sliding gates can prove to be an effective solution. Automatic sliding gates give you the luxury of opening the gates from within your house or car. At the touch of a button, the gates will slide open for you whenever you want them to. If you have guests over, you could open and close the driveway gates from the home itself. 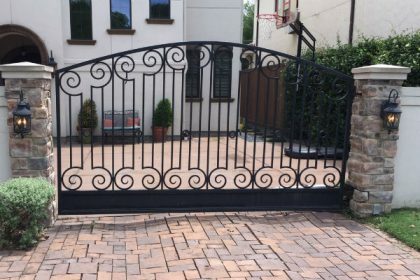 SAN ANTONIO DRIVEWAY GATE PROS… SIMPLY THE BEST QUALITY & PRICE!!! Security is an important consideration when choosing a gate for your residential or commercial needs. Automatic gates are more secure, as no one can open them without your knowledge. It is one of the best ways to stave off intruders and r. Automatic gates behave as an added security feature to your home. 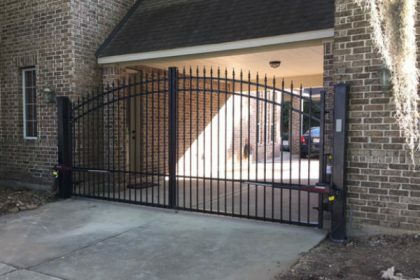 San Antonio Garage Door & Gate constructs sturdy and reliable gates and we make it our priority that our clients face no problems in terms of security. We guarantee your peace of mind and help you feel secure. Aesthetically pleasing sliding gates add prestige and value to your home, and actually contribute to increasing the price of your home, if you are planning to sell it in future. 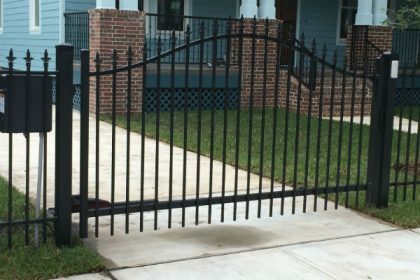 These gates are an ideal solution for you if you have less space across your driveway. They just require a track and can slide completely into walls. The gates disappear into the walls when you open them, and of course, slide out in a smooth motion when you close, all at the touch of a button. This feature of sliding gates makes them an ideal option when there is a constraint of space in your driveway. If you’re in a rush, these gates will save you time as they close on their own, saving you time and energy. A few minutes saved in your morning routine may help you beat the traffic on your way to work. And, as you don’t have to get down each time to open and close the gate, you can conserve your energy for better things. Our gates are designed keeping in mind ease of installation. 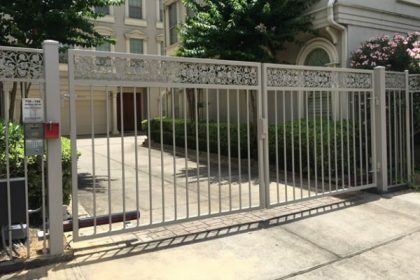 Our team of professionals have a lot of experience in the field and can ensure the smooth installation of your manual or automatic gates. Why Choose Us to Install Your Gate? With the experience and expertise in operating across San Antonio, we are reputed and trusted by thousands of home and business owners for offering top-grade quality of products and solutions. Besides having an extensive variety of products from several well-known brands on our catalog, we also offer custom designs per your specifications. San Antonio Garage Door & Gate has been providing customers with high standards of service consistently, as proven by our BBB A rating that we’ve been maintaining for years. Our products are continuously innovated using the latest technology. We offer our clients the best possible sliding gate solutions. Our research and design teams stay on top of industry trends to offer sophisticated, elegant and functional designs to our clients. Get in touch with us to help you choose and install the best sliding gates for your residential or commercial needs. Call us on (281) 520-3984 for no-obligation estimate and free consultation!